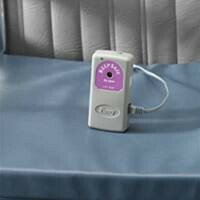 KeepSafe Fall Prevention Alarm Gel Foam Alarm Cushion System (POS6511) which includes the KeepSafe Fall Prevention Alarm Control Unit, 9-volt battery, saddle bracket, sound dampening plug, and the Gel Foam Alarm Cushion Sensor (POS7223F) an electronic pressure sensitive sensor pad with cushion designed for use in a wheelchair or geri-chair. Minimum patient weight of 50 lbs. when placed on top of a seat cushion and 65 lbs. when placed under seat cushion.